As we navigate the darkest (and shortest days) of the year, 40% of office workers are struggling to work in poor lighting every day. This has a negative effect on their productivity and wellbeing – according to a new research report, looking at the impact of lighting in the workplace. This is a recent research report by the UK company Staples, where an online survey of 7,000 office workers was conducted in October 2018. The research sample consisted of a sample of desk-based office workers from ten European countries including: United Kingdom (2,000, with 302 in London), Germany (1,000), France (500), Netherlands (500), Sweden (500), Norway (500), Spain (500), Italy (500), Portugal (500) and Finland (500). 80% of office workers, said that having good lighting in their workspace is important to them, and two-in-five (40%) are having to deal with uncomfortable lighting every day. A third (32%) said better lighting would make them happier at work. However, when access to natural sunlight is so limited in the winter, many are feeling stressed and suffering from seasonal affective disorder (SAD), and often spend long hours at their desks which is sometimes their only access to light during the day. The results have also shown that 25% of the surveyed are frustrated at having to deal with poor lighting in their workplaces. Often just 13-15 mins of exposure to natural light are enough to trigger the release of endorphins or “happy hormones”. Dr. Joe Taravella, a supervisor of pediatric psychology at NYU Lagone Medical center said that SAD “affects anywhere from 5% to 10% of the population:, which is a huge proportion of the population suffering from clinical levels of depression for up to a quarter of the year. Another research concludes that there is a strong relationship between workplace daylight exposure and office workers’ sleep, activity, and quality of life. 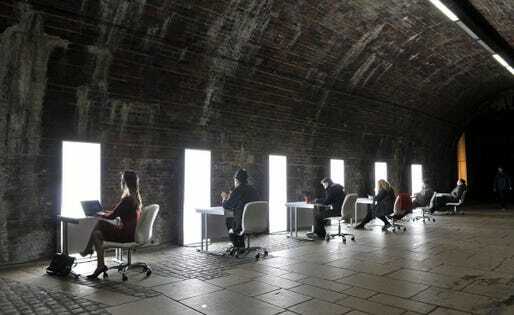 There are no statutory workplace lighting levels in the UK. Regulation 8 of the Workplace Health, Safety and Welfare (WHSW) simply requires that lighting at work is “suitable and sufficient” and that, where possible workplaces are lit by natural light. The emphasis on natural lighting and other related research reflects the consensus that daylight is the best form of light. But, in parts of the northern hemisphere, daylight by itself will not provide sufficient illuminance throughout a working area. This means that “sufficient and suitable” lighting usually needs a combination of natural and artificial lighting, and especially artificial lighting that can be personalized as per the activity, function and individual requirements, and those that can imitate natural daylight. The research by Staples recommends providing SAD lamps to employees, and to have cold-tone lighting with high illuminance in the mornings for maximum productivity. In this research report, 68% of the surveyed workforce admitted that they would feel more valued by their employers if they considered their health and well-being and invested in suitable lighting. Personalized lighting options can help create more inclusive work environments. One such way is the use of biodynamic lighting which can then adjust the lighting during the day for the tone and illuminance as per natural daylight levels outside, and also the individual requirements of the user. This way the employees feel more in control of their work environments, which has been shown to increase their levels of happiness and productivity in the workplace. Some lighting designers have recommended an emphasis on cooler, daylight temperatures, for example by adding more blue to the mix. A trial by the University of Surrey’s sleep research center suggests that certain wavelengths of blue light suppress the sleep hormone that regulates sleep/wake cycles. The trial compared alertness levels among staff working in the blue-enriched light with those on a control floor. It found that first thing in the morning and at lunchtime, alertness levels were the same on both floors. But another measure just before staff left for home found significantly higher alertness on the trial floor. Staff also reported improved sleep patterns, and although not scientifically validated, indicated that visual acuity was better with the blue light, and after four weeks, 92% of people on the floor said they preferred it over the old lighting. There is sufficient evidence now to show that well-being in the workplace can be hugely improved by providing lighting that mimics natural daylight, by bringing more natural light in with large windows, by providing suitable levels of illumination for visual acuity, and by providing personalized lighting that can be adjusted as per the individual biodynamics as well as the task on hand.